The French novelist Gustave Flaubert was one of the most important forces in creating the modern novel as a deliberate art form and in introducing this objective form of writing in France. Gustave Flaubert was born on December 12, 1821, in Rouen, France. His father, Achille-Cleophas Flaubert was a doctor and an important Rouen citizen, and his mother, Anne-Justine-Caroline Fleuriot, was a physician's daughter. He had an older brother, Achille, and a younger sister, Caroline, with whom he had a close relationship. Gustave began to develop his writing skills at an early age and wrote plays, which he put on for his family at the age of nine or ten. He loved to study history and was a wonderful reader. His sister died during childbirth when Flaubert was twenty-four. She left behind her daughter, Caroline Hamard, who was raised by Gustave and his mother. His mother would live with him until his fiftieth year. As an adolescent of fifteen, Flaubert fell in love with an older married woman, Elisa Schlésinger, and remembered her ever after as a pure and innocent love. The young man was sent to Paris, France, to study law. He had easy access to prostitutes (people who receive money for performing sexual acts), and this led to venereal disease (a sexually transmitted disease) from which he never recovered. Illness leads to writing career consciousness that involves a loss of muscle control]). He was crippled by his seizures, which were terrifying for him and reappeared at intervals throughout his life. In 1846 he had to face the deaths of his father and his beloved sister. Flaubert decided to quit his legal studies, since any emotional excitement brought on an attack of his epilepsy. He felt he must become an observer of life and not a participant in it, so he devoted himself only to his writing. Flaubert found peace in literature, for he had been slowly moving away from the idea of writing emotionally and moving toward the idea of writing as a detachment, which easily balanced with his physical state. He began writing The Temptation of Saint Anthony. He completed the first version in 1849, but he was unable to get it published. This was a bitter blow, and during the next twenty-five years he would spend time revising the work. After this failure Flaubert left immediately for a twenty-month journey through the eastern Mediterranean, accompanied by his lifelong friend Maxime Du Camp (1822–1894). He had studied Egypt and the Holy Land which he had described in his work Saint Anthony. He found that he was able to recognize places that he had only read about and described in his work. This proved to him that art could help to describe and envision reality. If a person has never viewed a particular location, they can see it through its description. In 1851 Flaubert began writing Madame Bovary, on which he worked until 1856. It was published in 1857 and caused quite a disturbance; Flaubert in fact was unsuccessfully tried on the charge of contributing to public immorality (the state of doing wrong, and behaving in a way that is not socially acceptable). This novel analyzes the rural middle class, as well as tells of Emma Bovary, a girl that goes through life with romantic obsessions that she can not resolve. At the end of the novel, she finds her dream world in shreds around her, and she prefers death to accepting a world that does not meet with her fantasies, so she takes her own life. Madame Bovary displayed a new technique for writing. 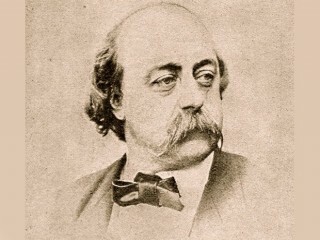 Flaubert believed that writers must write from observed facts and events. He wanted writers to be like scientists—objective, unprejudiced (fair), withdrawn, and impassive. Flaubert asked the writer to generalize his observations into an ideal, a type whose dynamic power becomes apparent through the artistry of its presentation. Flaubert's next work, Salammbô (1862), recounted the revolt of the mercenaries (people who are hired to fight for a foreign ruler) against Carthage in the third century B.C.E. The novel is repetitious; however, Flaubert's accurate reconstruction of ancient times did influence later historical novels. In 1864 Flaubert started work on A Sentimental Education, which was published in 1869. His great Parisian novel, this work is considered the equal of Madame Bovary although less popular. Flaubert's A Sentimental Education suggests that unfulfilled dreams are always superior to reality, which destroys them. The end of the 1860s and the start of the 1870s marked a period of disasters for Flaubert. He was stunned by the deaths of many of his closest friends. In 1872 he also lost his mother, the greatest of all his losses. Flaubert's depression shows in his next work, a revision (the third) of his earlier Temptation of Saint Anthony (1874). It summarizes his lifelong absorption with religion and proposes the beliefs that all religions are equally true and equally false, equally beautiful and equally a source of troubled emotion since they all must end. Flaubert had brought up the orphaned niece of his beloved sister. His niece was financially ruined in 1875, and he sacrificed his fortune in an attempt to help her. Bankrupt, unable to help her further yet worrying over both their situations, he turned to the writing of his Three Tales (1877): "A Simple Heart," "Legend of Saint Julian the Hospitaller" and "Hérodias." Flaubert began his uncompleted last work, Bouvard and Pécuchet, before the financial crisis of his niece; he continued it after he had finished the Three Tales. On May 8, 1880, Flaubert died from a brain hemorrhage (the bleeding from a broken blood vessel) after having spent his last years in anguish. He was sixty years old. View the full website biography of Gustave Flaubert (En. ).